Perform a VIN lookup in California on any car you are interested in purchasing or selling to ensure that the vehicle is completely reliable. 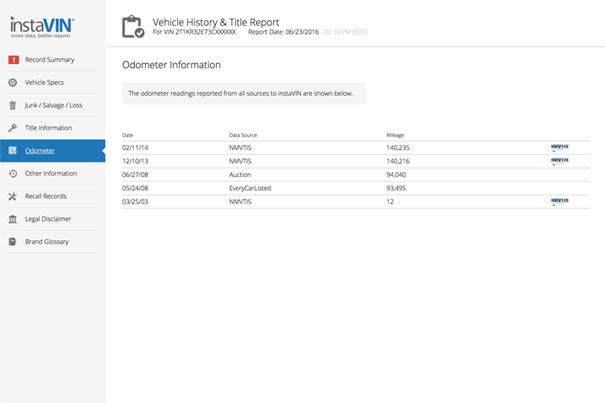 The VIN number lookup can provide you with information about any car accidents in which the vehicle has been involved, a comprehensive safety report for the vehicle, whether there are any recalls or defects and much more. This report can be very helpful for both buyers and sellers of a car, and for anyone interested in learning more about a current vehicle. An immediate VIN lookup in California be provided to you if you order the report online. 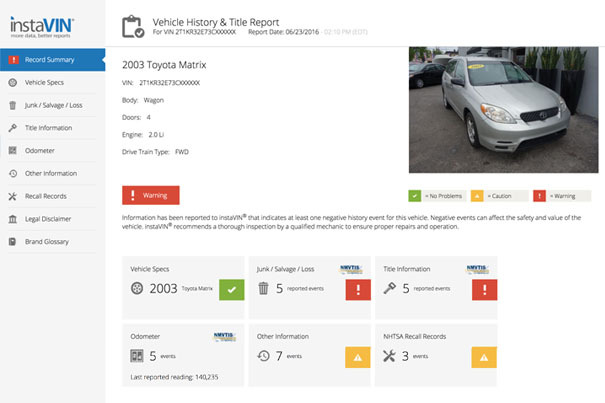 This VIN code lookup allows you to access important information about the vehicle, including a safety report and a car accident history report, both of which can be used to help you determine whether or not you should purchase a pre-owned car, or whether or not the car is likely to sell. The online ordering method to lookup VIN information provides very up-to-date information, and it is ready immediately after you place your request. Although other methods, such as mailing in a request form, are available in California, you should keep in mind that the online VIN check method is the fastest, and often provides information in the most comprehensible way. Looking up VIN numbers can also be done through the mail, although it takes a longer amount of time than using an online method. 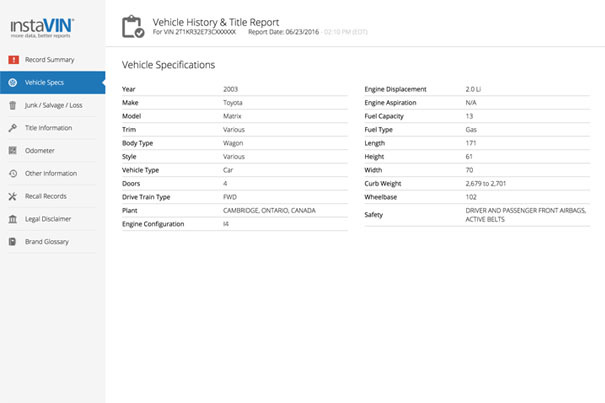 However, you can receive an official VIN history report that provides important information without placing a request online. This method can be beneficial if you do not have access to the internet, and would rather fill out a physical form to submit. A VIN number report can be provided once you have been deemed a certified user. To lookup a VIN number, you must fill out the Request for Vehicle Registration Record (also referred to as the INF1125 form), pay the applicable fee and mail the application package to the DMV headquarters address that is located on the form. You can then expect to receive the VIN report in the mail within a couple of weeks. To avoid the wait, click here to start ordering an online VIN report. What info is in a California VIN history report? Why would I need to perform a VIN check in California? A VIN report is a necessary step before either purchasing or selling a vehicle in the state of California to ensure that the vehicle is up to either your standards or the standards of any potential buyers. 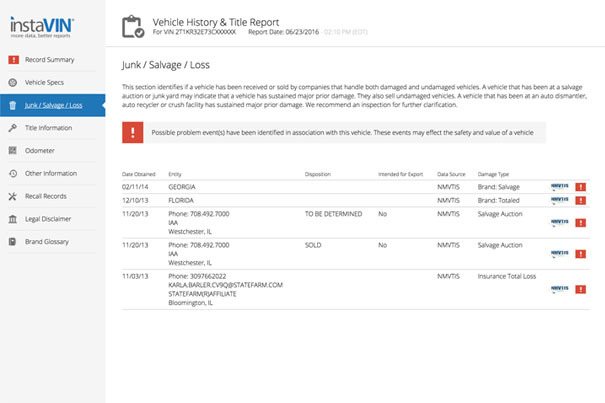 The information in the VIN check will allow buyers to research the history of the vehicle to understand how safe it truly is. An online VIN code lookup will provide comprehensive details to anyone interested in purchasing a vehicle, so if you are selling a car, it is advisable that you access your car’s VIN number report and allow any interested buyers to look through it. This can help you to negotiate an appropriate price based on how reliable the car is, and may help you sell the vehicle faster. If you are looking for the VIN location on a motorcycle, you will likely find it around the steering neck or on the motor. Regardless of the type of vehicle, if you cannot find the VIN located on the physical vehicle, it is likely listed on both the car registration documents and the auto insurance card/paperwork for the vehicle. A $5 fee must be paid for a vehicle history report to be issued in California.